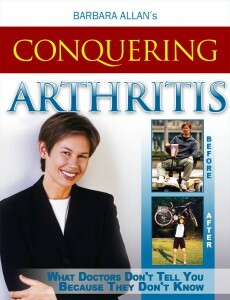 Barbara Allan, author of the best-selling book, Conquering Arthritis, created The Conquering Rheumatoid Arthritis Course: the 17 Secrets Method based off the 17 secrets she learned healing her own arthritis and coaching others through the healing process. She has collected her many years of knowledge and experience and formed them into a comprehensive and effective online course for getting well and truly conquering arthritis. Through a series of weekly videos, she takes members step by doable step, through the process she used to heal her own arthritis. By the end of her 28-week course, the goal is to not only achieve symptomatic control, but to fully heal the underlying causes and be completely arthritis-free!